Parents and Tots are based at the Link community centre. The Link is managed by LASC Childcare Services. The community centre has a café, 3 Tier soft play and community rooms available for hire. Other community groups such as Lunch Club, Dance, Craft & Chat also use this venue. 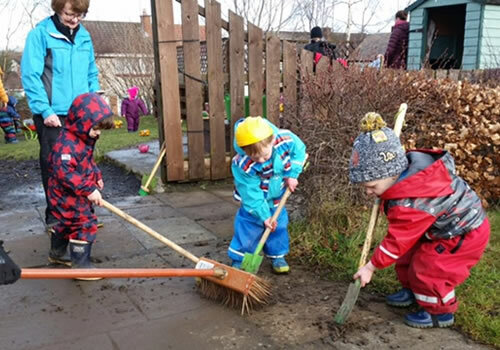 Parents and Tots have invested time and also National Lottery Funding into the Community Garden. We have plenty of raised beds, a green house, polytunnel, storage sheds, compost area and of course our Wormery. Community Garden Volunteers are always welcome. The Link Sensory Garden is part of the community garden. This beautiful outdoor play area is buggy/wheelchair accessible and where we base our Muddy Play sessions. Having the facilities of the Café so close by is ideal for a hot drink & snack on a cold day. There is a fantastic new Midlothian Council play park next to the Link. The equipment is suitable for both younger and older children.